SUBHEAD: This techno-optimistic agenda requires little or no lifestyle adjustments - just a high-tech boondoggle for $trillion$. Image above: A healthy climate is not always as it seems. 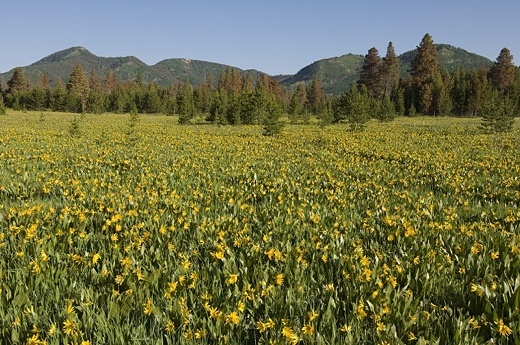 Redkill Lodgepole Pine stand behind a field of Douglas' Sunflower at Steamboat Lake State Park, Colorado. Less than 0.7 degree Celsius of average warming across the globe was responsible for allowing the native mountain pine beetle to kill 20 percent of western US forests between the late 1990s and 2010. The attack continues today with the addition of spruce and fir beetles to the infestation. Photo by Bruce Melton. From original article. [IB Publisher's note: Below is the second half of a long article on how to save our world from Global Warming. Click on link above for full piece. The first half of the article dealt primarily identifying the problem and with efforts to date. Bruce Melton show he understands the problem. However, he seems blind to the solution. This brings us back to that question: How do we move forward? Some of the tools for getting us there are widely known: efficiency increases, alternative energy, agriculture improvements, reforestation, electric cars, smart grids, DC power transmission, showering with a friend. These are all important and critically so, because of the great risk of further increasing extremes. But these tools all allow warming of double to more than triple our current level before the temperature begins to very, very slowly cool. Emissions reductions help -- in that they reduce the amount of CO2 that we are releasing into the sky -- but even with aggressive emissions along the lines of the greatest reductions feasible, our climate continues to warm for at least 50 years. What is needed, if we are going to leave our children a healthy climate, are tools that can immediately begin to reduce the very long-lived CO2 that is already in our sky. Fortunately, science has advanced a bit over the past 20 years. There is now a set of technologies out there that have been proven to do the job of atmospheric carbon removal. For $21 trillion (the cost of US health care from 2000 to 2009), we could create an infrastructure that would remove 50 ppm CO2 from our sky and make a huge dent in the atmospheric loading that is causing the warming. This cost is about $200 per ton of CO2. Newer technologies hold even more exciting prospects cost-wise. The best estimates for new technologies are at $20 per ton for capture and 20 percent more for disposal. The company, Global Thermostat, in Menlo Park, California, has a full-scale industrial pilot project that uses waste heat and is reportedly capturing CO2 at $10 per ton. Some of the new technologies are even more compelling. One new line of research shows that CO2 captured directly from the sky can be used to create carbon nanofibers, a very advanced material that could be used to build almost anything from automobiles to homes. Production costs are similar to that of aluminum and the carbon fibers have a value 1,000 times that of aluminum. There is a fuel cell technology that can capture carbon dioxide from direct fossil fuel generation emissions that does not require additional energy and actually increases the generation capacity of the energy facility. Then there are the solar radiation management technologies (SRM), such as injecting sulfates or tiny mirror-like particles into the upper atmosphere to reflect sunlight. There is some very important work ongoing in this field of geoengineering that could be revolutionary as well. But whereas the climate pollution removal techniques described above are relatively simple, the implications of SRM are no less significant than the greenhouse gas experiment we have been implementing for centuries. Take sulfate injection, for example. This technique is often suggested to have grave acid rain consequences but the amount of sulfates used is 100 times less than what is required to create significant acid rain. Maybe more importantly, once sulfate injection ceases, impacts to the atmosphere are completely gone after two years or less. The bottom line, however, is that atmospheric geoengineering is little studied and fraught with challenges, and far more work needs to be done before implementation is seriously considered. We need to give ourselves permission to go beyond emissions reductions alone and seek a healthy zero-warming climate. A group of dedicated academics and climate science outreach specialists are doing just that. The Healthy Climate Project is the first to approach the issue of a zero-warming healthy climate. What we can do as individuals is vitally important because policy grows from public will. Discuss healthy climate goals with your peers. Mainstream the concept. We need to fund development and increased research for even more compelling technologies than already exist, build a safety monitoring organization (like the Food and Drug Administration, but for carbon removal), and scale up these technologies. The Healthy Climate Project is the first of its kind. Its "Declaration" asks President Obama to authorize research to complete the industrialization of new atmospheric CO2 removal and storage technology and commit to a healthy climate for America. We have the tools. Now we need to allow ourselves to go beyond emissions reductions alone, in order to leave our children a planet free from dangerous climate change. Note: Detailed references for the claims in this article can be found here. • Bruce Melton is a professional engineer, environmental researcher, filmmaker, author and CEO of the Climate Change Now Initiative in Austin, Texas. The Climate Change Now Initiative is a nonprofit outreach organization reporting the latest discoveries in climate science in plain English. Information on his book, Climate Discovery Chronicles, can be found along with more climate change writing, climate science outreach and critical environmental issue documentary films at www.climatediscovery.org. Images copyright Bruce Melton and the Climate Change Now Initiative except where referenced otherwise.